Through more than half a year’s preparation and all staffs’ efforts, finally, our efforts were rewarded. 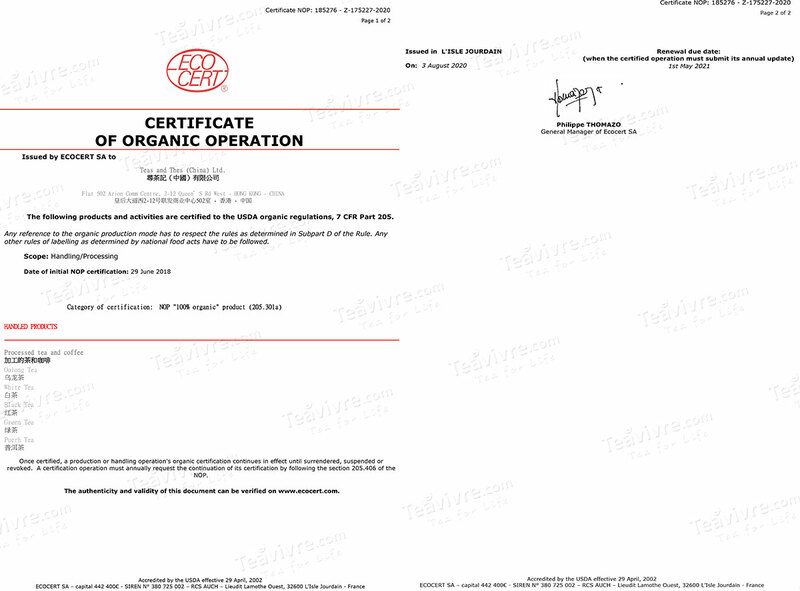 TEAS AND THES (CHINA) LTD. has awarded USDA and EC Certified Organic. Organic Certification is the highest level of food safety certification. In June, 2018, before our 7th anniversary, we successfully passed audits of internationally renowned certification bodies ECOCERT SA and awarded USDA and EU Certified Organic. TEAS AND THES (CHINA) LTD. is committed to providing the best quality products and services and attaches great importance to the Food safety. This time we successfully passed USDA and EU Certified Organic, which proves our commitment and is also a guarantee of customer expectations.